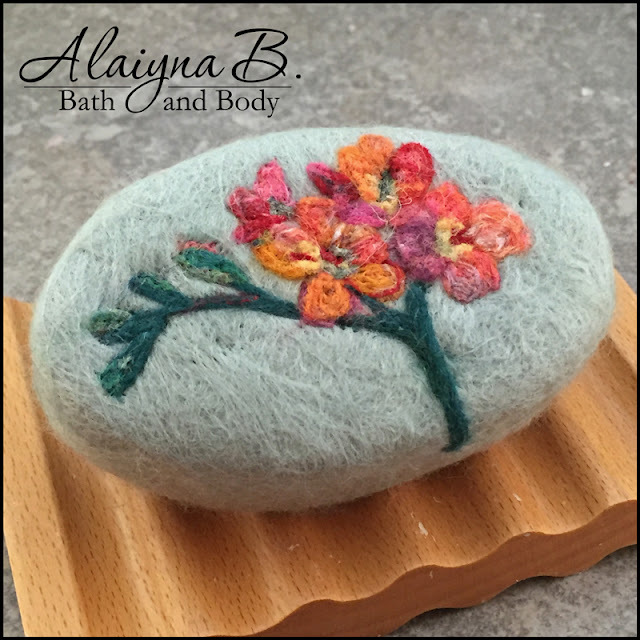 I really love to make felted soaps. It is a great way to do something unique and creative with extra bars of soap from a larger batch or to give a new life to wonderful smelling soaps that just are not as visually attractive as I had hoped - it is like a makeover for soap. Below are some of my most recent creations. 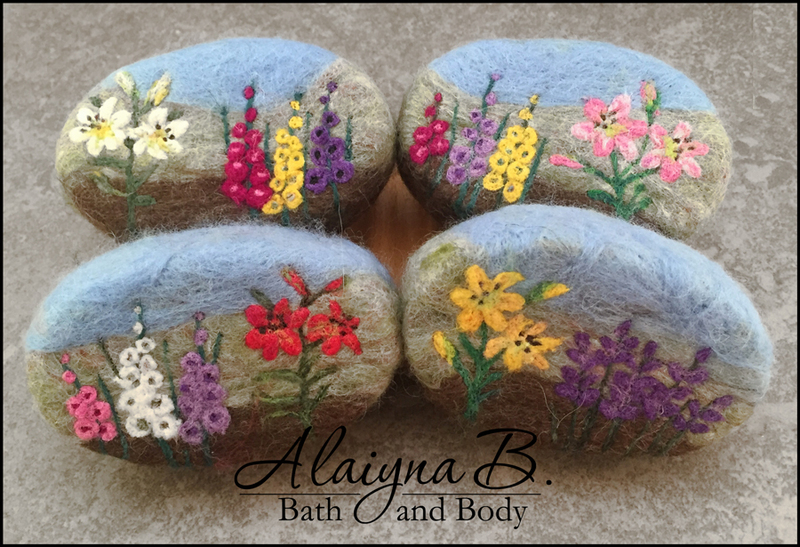 The felted soaps have been extremely popular - especially the garden and floral themed ones. Each cold process soap (you can felt over melt and pour too) is first wet felted using carded merino top wool, Romney wool or a wonderful merino and silk blend - some soaps use several wool varieties. Then the designs are needle felted on using the same types of wool for the wet felting. It takes very little wool (about .25 - .3 ounces) to encase an entire 4 ounce bar and even less to create the needle felted designs. The design possibilities are endless with these and are a wonderful creative and relaxing outlet. These are so beautiful - love them! Thank you - I love making these. These are so beautiful! I am completely in love with these flowers. So spring-y!!! Any chance you could have some tips for me? Hi Jin - thank you for your kind words. I use either 38 or 40 size needles and they do break on occasion. You will have less needle breakage if the soap is still a bit wet from the wet felting as the surface of the soap is a bit soft in case the needle penetrates the soap (which it will). That is not always easy to do as I will wet felt several soaps at a time then proceed to needle felt them later (sometimes days later) and they are usually quite dried out by then. 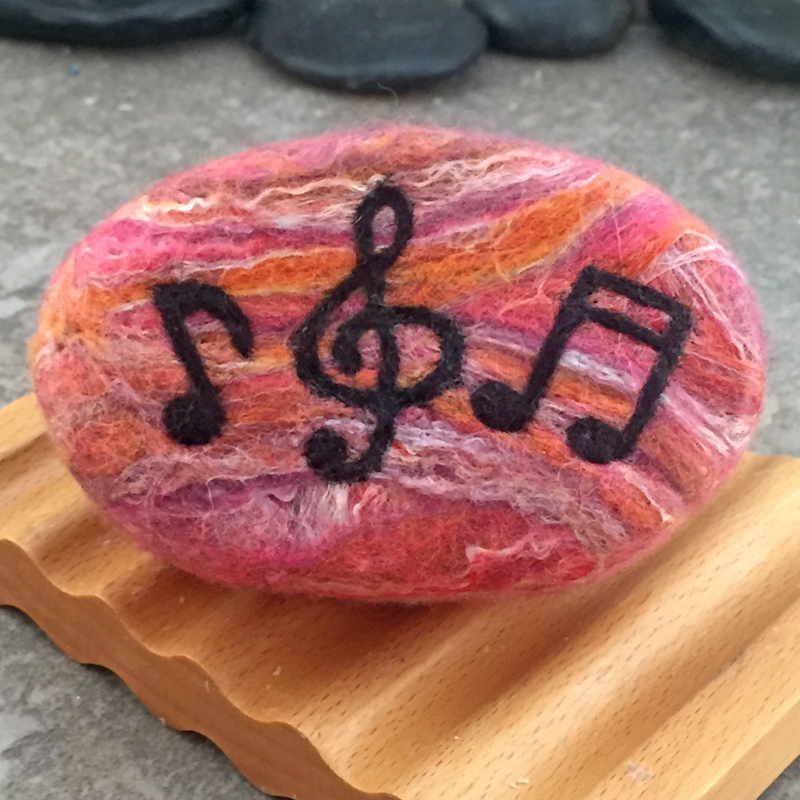 Try to needle felt as shallow as possible so as not to get the needle too far into the soap. A light touch works best to prevent breakage. I didn't even think about doing the needle felting while still wet... LOL Such simple yet brilliant idea!! Thanks again!! !